It’s easy. Wherever you start from, however you travel, getting to The International Centre couldn’t be easier. The International Centre has over 1500 car parking spaces onsite, all within easy walking distance of the venue. There are regular services from Birmingham New Street, Wolverhampton and Shrewsbury. The International Centre is situated just over a mile from Telford Central Station, the Southwater Event Group has laid on a shuttle bus from the railway station to Slide, leaving every 15 minutes. 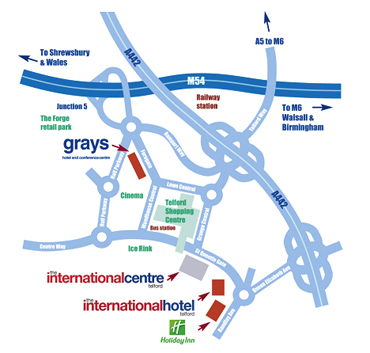 The International Centre is less than an a hour by road from Birmingham International airport. There are also rail connections from Birmingham International Station via Birmingham New Street.